The Sorbian languages are a Slavic branch of the Indo-European languages. They are the native languages of the Sorbs, a Slavic minority in eastern Germany. Historically the language has also been known as Wendish or Lusatian. There are two languages: Upper Sorbian (hornjoserbsce), spoken by about 40,000 people in Saxony, and Lower Sorbian (dolnoserbski) spoken by about 10,000 people in Brandenburg. 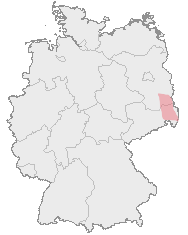 The area where the two languages are spoken is known as Lusatia (Łužica in Upper Sorbian, Łužyca in Lower Sorbian, or Lausitz in German). In Germany, Upper and Lower Sorbian are officially recognized and protected as minority languages by the European Charter for Regional or Minority Languages. In the home areas of the Sorbs, both languages are officially equal to German. The city of Bautzen in Upper Lusatia is the centre of Upper Sorbian culture. Bilingual signs can be seen around the city, including the name of the city, "Bautzen/Budyšin". The city of Cottbus (Chóśebuz) is considered the cultural centre of Lower Sorbian. Cottbuss also has bilingual signs. Sorbian is also spoken in the small Sorbian (“Wendish”) settlement of Serbin in Lee County, Texas. Until recently newspapers were published in Sorbian there. The local dialect has been heavily influenced by surrounding speakers of German and English. American and Australian communities often prefer to call themselves “Wends” or “Wendish,”. They think that “Sorb” and “Sorbian” are bad words. This page was last changed on 24 January 2018, at 07:55.